MCAA does this by providing our members with high-quality educational materials and programs to help them attain the highest level of managerial and technical expertise. 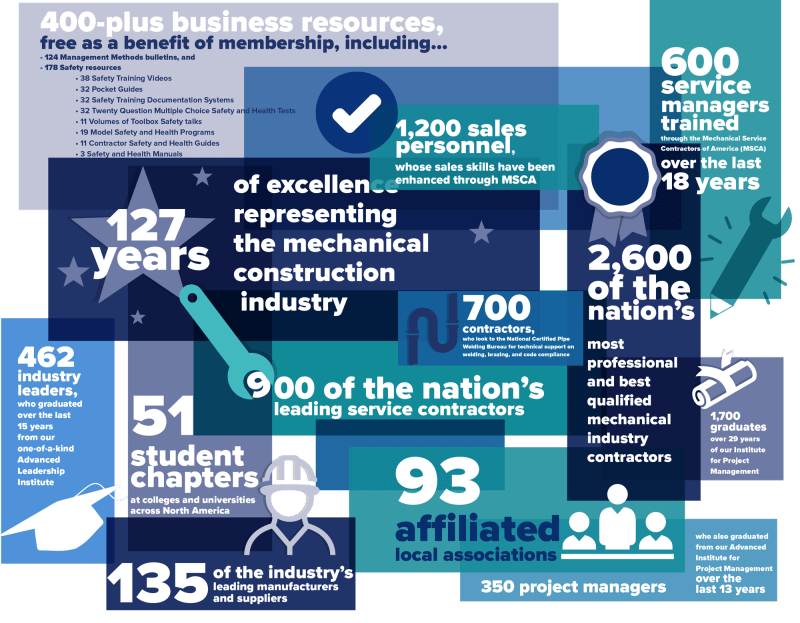 MCAA includes the Mechanical Service Contractors of America, the Plumbing Contractors of America, the Manufacturer/Supplier Council, the Mechanical Contracting Education and Research Foundation and the National Certified Pipe Welding Bureau. MSCA is the leading organization for HVACR contractors, providing education, marketing, and labor/management services to assure its contractor members deliver quality performance, value and expertise for all building system needs. MSCA members perform service, maintenance, replacement, retrofit and repair work resulting in enhanced reliability, tenant satisfaction and efficiency. MSCA has more than 1,400 member companies and is a subsidiary of the Mechanical Contractors Association of America.